I prefer the clay origin and all. But the idea that she's still clay, that she's not really flesh and blood just leads to people thinking she's not a real person. And it's down this road that we get the awful Donna Troy from Finch's run. 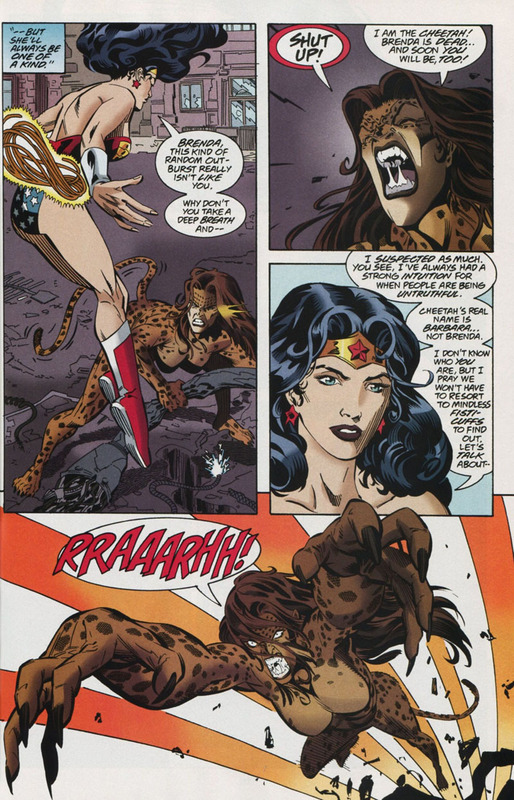 It's strange 'Face had the archeo-level research skills to suss out Diana's clay origins, but not double-check who Cheetah really was along the way. Aside from his penchant for method acting, the latter seems to be easier information to uncover than the former. Barring that, though, this is actually a pretty good untapped interaction! It reminds me of that Hal Jordan arc where Larfleeze stole Brainiac's collection of cities: it's a perfectly unsurprising combination once it's on paper, but it's still impressive how no one's really put the two halves before. I think Diana has publicly stated it a time or two. 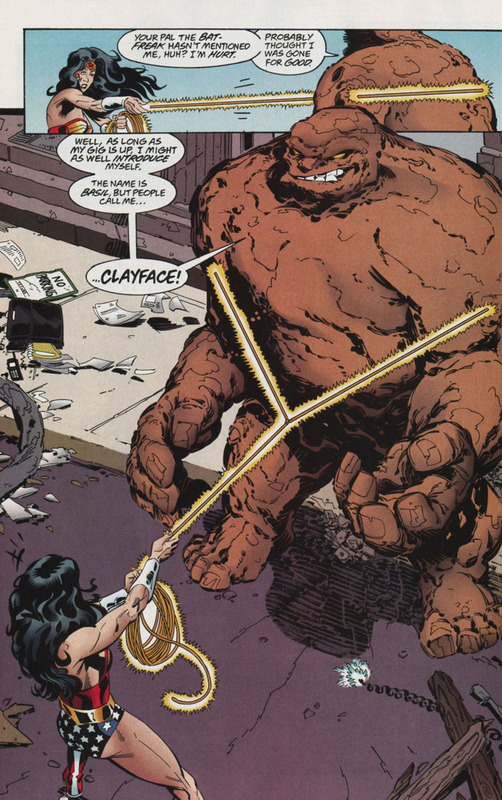 Clayface strikes me as overstated his research. He gets some of her clay, becomes superpowered, she beats him, and getting her clay back, actually gets a small power-boost. Yeah, okay, she probably would've mentioned that, being in her ambassador/interview phase and all. I can probs buy that. Thanks! Seems like that kinda got off the rails there: I'll go check it out. 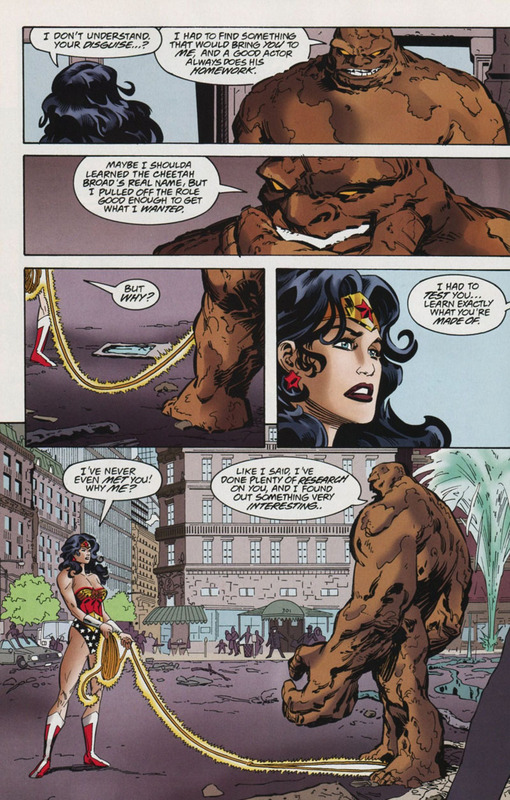 One of my favorite scenes, not even a whole story, is when Wonder Woman uses the lasso on Anarky and he spills before adding that she should be using it on politicians, impertinent as always but I do think there's an interesting dynamic there in him initially having gone off track due to losing an overseas friend in a war. Heck, come to think of it, why doesn't Wonder Woman have a whole class of minor villains trying to convince her to use her lasso for this or that? Not just any of them will do. I've just found Anarky's run-ins with the broader DCU interesting . Ollie, Kyle, Jeb, Diana, etc. Diana's was the briefest of these but conceptually, I think it would make for an interesting team up especially given his contradictions. Agreed, he's a nice character to shine a light on others. Ummm, NOT a fan of this. Diana is not a golem, or in any sense animated clay. She was formed of clay, but was turned into a living being by the power of the gods. 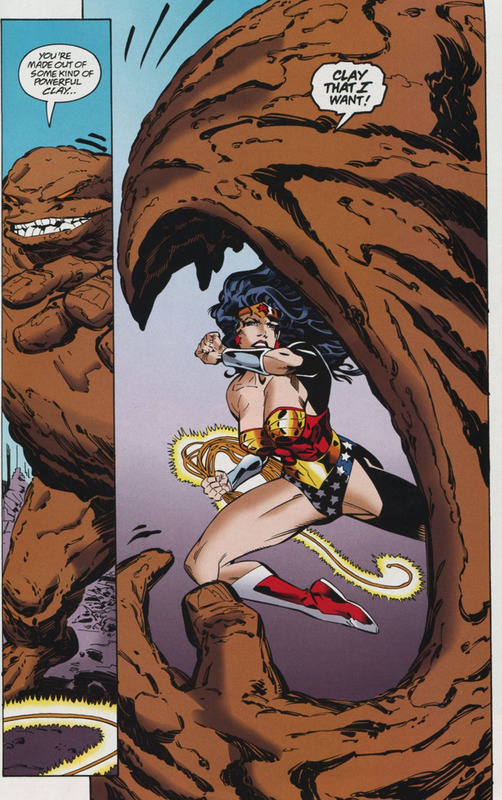 There's no clay in her for Clayface to be interested in. I honestly really like the golem angle. I adore it whenever its brought up. Yea, I kinda do too. I mean, it doesn't make her less of a person or not flesh, but it's got a kind of mythic transhumanism nod. As soon as she was given life, clay ceased to be relevant, and more than the carbon in the food our mothers ate defines what makes us human. The clay gave her shape, not substance and suggesting she's still fundamentally clay rather than a living, breathing person seems to imply she's less than human. That's pretty cool, Face can absorb her like Majin Buu, and add to his own power. What happened in the end? I don't like this idea either. Diana is flesh and blood, otherwise she is not human and that makes her a totally different character. Points for creativity but this is not true to the character of Wonder Woman.